What is Spin & Win? Spin & Win is a game inside Opera News. 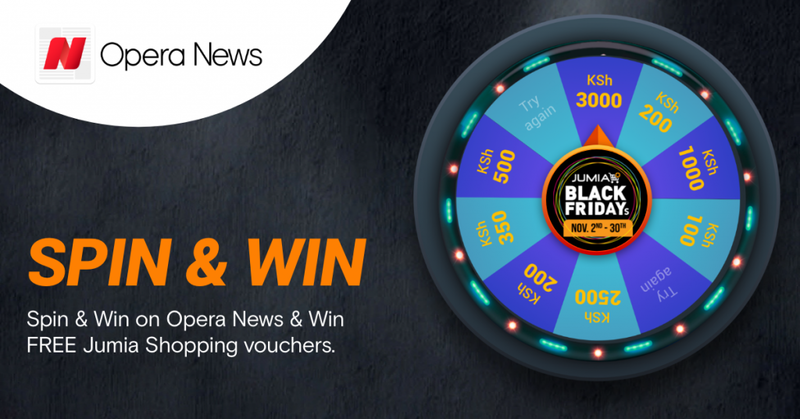 By spinning the wheel, Opera News users have the chance to win Jumia shopping vouchers. The number of spins per day are limited. Additional spins can be won by inviting friends. Spin & Win will be active from October 29 to November 30. All vouchers can be redeemed from November 2 until December 8. How do I win vouchers? Where can I access my vouchers? Vouchers can be accessed through the My prizes icon found in the upper right corner of the Spin & Win page or by visiting your personal profile through “Me” > “My Prizes”. How many spins do I have per day? You will receive 3 spins per day and are limited to play 5 spins per day. Additional spins can be won by inviting friends through an invitation code. You can earn unlimited spins, but only 5 spins per day can be used. The spins will be added to your daily spins if the friend has successfully downloaded Opera News and participates in Spin & Win. How can I get more spins per day? Additional spins can be won by inviting your friends to Spin & Win. To share the code with your friends, go to Spin & Win and generate an invitation code, as shown below. Share the code to your friends on Facebook, WhatsApp or other social media channels. How many friends can I invite to Spin & Win? You can invite as many friends as you want. I invited more than 5 friends today. Why can I only spin 5 times today? The maximum number of spins per day is 5. However, all additional spins collected by inviting your friends will be saved to your balance and you will get the chance to use them throughout the campaign period. Where can I use the voucher codes? The voucher codes can only be used on the Jumia Kenya online store. To navigate to the website, please follow the steps below. Can I use multiple vouchers at once? You can only use one voucher code per transaction. It is not possible to stack the vouchers. I have a problem with my Jumia order. Who do I contact? For any questions regarding your placed order or the Jumia website, please contact Jumia Support at 0711 011 011.